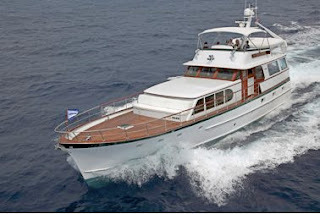 Confirm your winter 2009/10 charter on KALIKOBASS II by October 31, 2009 for special pricing! 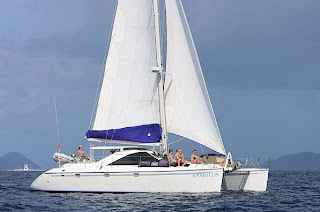 All Caribbean winter 2009/10 charters on KALIKOBASS II that are confirmed by October 31, 2009 may book on “Caribbean Terms” (inclusive except bar, dockage, local taxes) rather than "plus all expenses" terms. This offer is good for Christmas & New Years charters, too! Bookings confirmed after October 31, 2009 will revert to standard pricing of plus all expenses. KALIKOBASS II is a 104-foot sloop with a crew of 4. 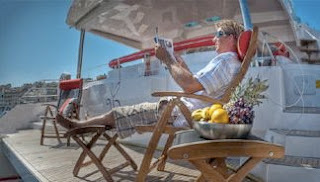 Kalikobass can accommodate up to 8 guests in 4 cabins. Cabins are flexible as they can be configured as Kings or Twins, plus the forward cabin can also remove its center partition and be a full-width stateroom. Very cool! 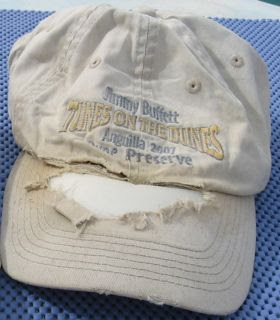 It appears not to be just a rumour anymore, as Jimmy Buffett is now on the schedule for a quayside concert in Gustavia, Saturday 7th November 2009 at 8:00 pm. What better way to partake of this event than on a boat? Contact Paradise Connections Yacht Charters and we'll hook you up! It's easy to fly into Sint Maarten/St Martin (airport code=SXM) meet your boat, enjoy sailing the islands of St Martin & St Barts (Saint Barthelemy), and participate in the anniversary festivities. 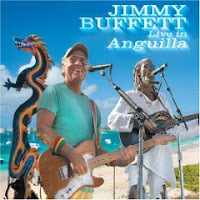 We enjoyed Jimmy's concert in Anguilla a few years ago (we're on the DVD!) and we helped several good folks charter yachts for that Parrothead gathering. They thoroughly enjoyed the festivities in the authentic tropical venue. Get in the mood & check out Amazon's Jimmy Buffett MP3 downloads for a quick getaway to Margaritaville! So, drop us a line, come on down & have a good time! Hope to see you there. We would like to remind you of some special offers that are still in effect on yacht charters... Don't miss out! Hope you'll be able to take advantage of one of these special offers. AERIE, a 124-foot Delta Marine motoryacht, has a special offer for Christmas week in the Virgin Islands. Treat yourself to a Christmas gift of a weeks' charter aboard AERIE and enjoy the Virgin Islands at an exceptional price that is lower than their standard rates for this premium week. Aerie is 124 feet with a crew of 6 and accommodates up to 8 guests in 4 cabins... 10 guests if you wish to use the convertible in the Sky Lounge! Ho Ho Ho !!! This is a fabulous deal!! Book 10 days on COCONUT over Christmas and / or New Years and get 11th day free! COCONUT is an 80-foot Dynamique sloop, with a crew of three. COCONUT is fully air conditioned and accommodates up to 6 guests in 3 double cabins. 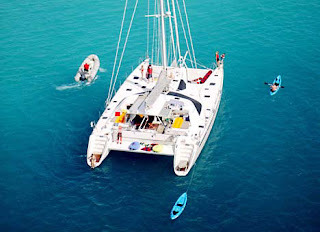 COCONUT is now offering all-inclusive charters which includes all meals aboard the yacht and standard ship's bar. 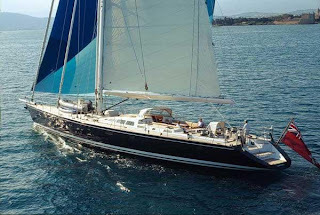 We would like to welcome s/v LIARA, a new Performance Yacht 100, to the yacht charter fleet. Following on from the flawless success of the first LIARA, the owners of this distinctive vessel re-commissioned renowned designer Bill Dixon to create the sensational new 100+ foot Liara. 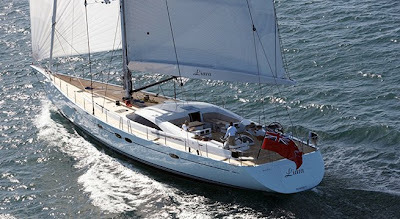 The flagship of the Performance Yachts range of Dixon vessels, LIARA brings to sailing the very latest technology combined with sophisticated elegance and timeless craftsmanship that will please all sailors, from the most dedicated racing-performance seekers, to the first-time, leisure cruisers. Superb accommodation and entertainment for up to seven guests is provided with exclusivity, style and comfort. Master Stateroom has a queen & a single bed, ensuite head & shower with marble vanity, lots of stowage space, pop-up 26” LCD television. LIARA's state of the art electronics inventory includes touch screen remote controls for television, lighting, blinds, stereo, satellite television, iPod docking station with onscreen controls and VOD (video on demand) server. 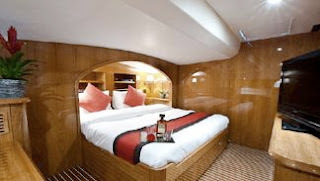 Guest Stateroom has a queen bed, ensuite with head marble vanity and separate shower. 22” LCD television and touch screen remote control for TV, lighting, blinds, stereo, iPod docker with onscreen controls and VOD server and shared access to satellite television. Guest Stateroom with 2 single beds, ensuite head with marble vanity & separate shower. 22” LCD television, and touch screen remote control for TV, lighting, blinds & stereo, iPod docking station with onscreen controls and VOD (video on demand) server, shared access to satellite television. LIARA's large full-width salon is nearly 7 meters wide. The dining area to starboard has seating for eight guests, a wet bar area with ice maker and sink to starboard, and a lounging area to port with two extra large leather sofas, coffee table, 40” LCD television including touch screen remote controls for television, lighting, blinds, stereo, satellite television, an iPod docking station with onscreen controls and video on demand server, plus control of cockpit audio. All audio by BOSE in salon and cockpit. The galley and crew areas are located aft of salon which includes a large crew mess, two crew cabins with ensuite heads/showers, and a crew companionway aft leading to the sailing cockpit. We look forward to visiting LIARA at the Antigua Charter Show in December and meeting Captain Ross Appleby & Chef Rosie Danby, along with the rest of their crew. 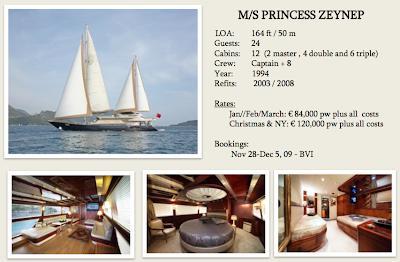 M/S PRINCESS ZEYNEP is available for charter for the Christmas & New Years weeks in the Caribbean (home port: St. Maarten). 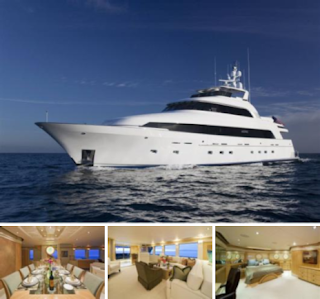 She is the perfect yacht for large groups with her capacity of 24 guests in 12 spacious guest suites. Captain Metin Karaman is eager to welcome new guests on board for unforgettable vacations in the Caribbean. The charter yacht ICARUS is a beautiful 88-foot (27m) performance sloop designed by Doug Peterson and built by Jongert in 2007. Her design offers ample space and volume for a luxurious and comfortable interior layout, while her sleek lines render exhilarating sailing performance. ICARUS is fully air conditioned and accommodates up to 6 guests in 3 cabins. The master cabin has a walkaround double bed, and ensuite head/shower. The other two guest cabins have lower twin berths, each with ensuite head/shower. ICARUS features a deck saloon that has a roof that completely slides open and cockpit settees that transform into sunbathing lounges. Her interior is styled in whitewashed teak with brushed stainless steel detailing, creating a light, modern atmosphere. What a fine addition to the yacht charter fleet. We look forward to booking s/y ICARUS. 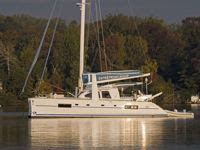 We've received an email from Bruce and Laura, owner-operators of the charter catamaran AMARYLLIS, a 45-foot Privilege. They've been busy this summer preparing Amaryllis for another successful charter season. In spite of the soft economy, we continue to make investments in AMARYLLIS to keep her ahead of the pack. We've installed electric heads, replaced vinyl paneling in the aft staterooms, repainted the cockpit, added new deck mats that double as floats, and made new cockpit throw cushions. Having raised two kids on boats in the Virgin Islands, we especially enjoy having kids on board. Whether towing kids around the harbor in a tube, introducing them to snorkeling, or teaching new card games, we always have a great time. 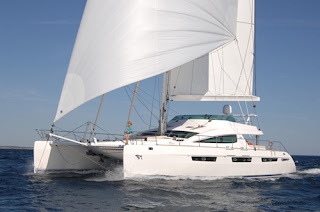 And we are continuing our 'one child free' promotion for the upcoming 2009/2010 charter season. For our charter guests we never cut corners. 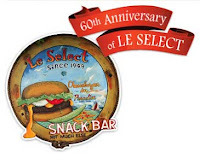 We provide the finest and freshest provisions available and always have the bar stocked with their favorite brands. Our 'all inclusive' charter is exactly that. AMARYLLIS has two identical forward cabins that have double berths, each with ensuite heads. 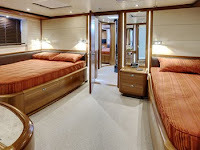 The two aft cabins also have double berths but differ in that they each have a sink in the cabin and share a head/shower located next to the cabin in the starboard hull. AMARYLLIS is a great choice for two couples, or a family of 4-6. 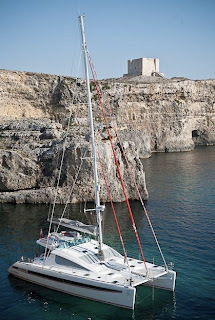 We are pleased to announce a new yacht to the charter fleet, Bella Principessa, a 2009 Privilege Alliaura catamaran. 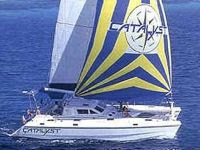 She will be accepting charters for the Caribbean 2009/2010 winter season. New boat, but "old" crew. Willo and Charlotte used to crew the charter catamaran Aldebaran. Charlotte will be staying on the other side of the pond this winter, so Bella Principessa will be a 6-guest, 3-cabin boat as they need two cabins for the crew. Plans are to go to the Pacific after this winter season... Inquire! Willow oversaw the building of this catamaran, so we know it will definitely be up to snuff. Bella Principessa (quite a mouthful, that!) is a 62-foot Privilege 615 catamaran, fully air conditioned, and offers a large owners cabin (port & center) and two aft cabins, all king size staterooms, each ensuite with head and spa shower. Lots of watertoys and lots of space. Willo is a Dive Master and 2 dives/day (with gear) are included for certified divers. We are looking forward to viewing Bella Principessa at the Antigua show in December, and hope we'll share an anchorage with them beforehand. It will be great getting together with Willo again and catching up. 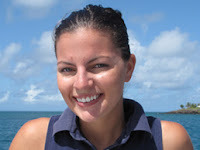 With Virginia and Jamie moving over to the charter catamaran MATAU that we mentioned in a previous post, you might be wondering about the new crew for catamaran TRUE NORTH. Meet the experienced team of Whitey and Max, who are thrilled to be the new captain and chef on TRUE NORTH, a 65-foot Privilege catamaran. 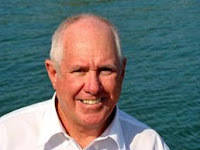 Whitey and Max have many years and miles of chartering throughout the Caribbean. This past year has taken them from Venezuela to Antigua, St. Maarten and the BVI, as well as a passage across the Atlantic followed by a great land trip through Portugal, Spain and on to Mallorca. During their travels they always seek new ideas to help them continue to offer guests a fresh, yet high standard of service, in a relaxed and enjoyable atmosphere. In addition to all the water sports, you can expect to get in some great scuba diving from TRUE NORTH. Whether you are certified or just wanting to try it out, everyone can expect safe and interesting diving with Whitey as their PADI Dive Instructor. The one dive that Max doesn’t pass up is the one with the two seahorses in the BVI – she seems to be the only person to locate them consistently, which is always a thrill to their guest divers. Of course, providing fabulous service on TRUE NORTH requires a great team. We are happy that Sara Manning is staying on board as stewardess for a second year. 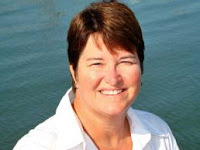 Sara comes from a boating family and has a great enthusiasm in chartering. They are currently interviewing for an experienced Deck Hand to round out the team. 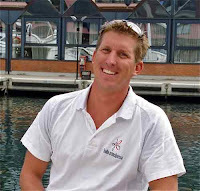 You view crew profiles on their online brochure. This is Max here of True North. We are excited to be moving on to True North and look forward to meeting and seeing you in Antigua. Yes, it is true we will be actively diving from True North. It's a passion of Whitey's, the Captain. 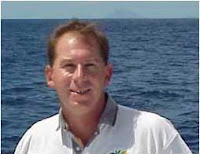 He is a safe, competent and very patient dive leader and instructor. Plus, Maxine is a Dive Master. Diving for certified divers is at no additional charge. We do not set any limit on the number of dives with our guests. Whitey assesses their abilities and the schedule and other activities for the boat that week and then plans the diving accordingly. Any instruction is at an additional charge: $250 for referral open water course, $250 for resort course. For any other instruction, please inquire. True North has 8 sets of regulators and gear. There are 8 tanks and a dive compressor. Regarding the calendar, the plan is to be in the BVI's through May and to go down island in June 2010. 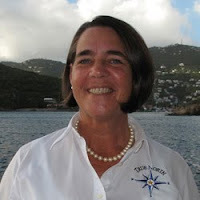 We have been diving in the BVI's for years and know lots of great dives there. We look forward to visiting TRUE NORTH soon. The 112-foot Swan, HIGHLAND BREEZE, will be returning to charter the Caribbean for the winter 2009/10 season with no delivery fees. 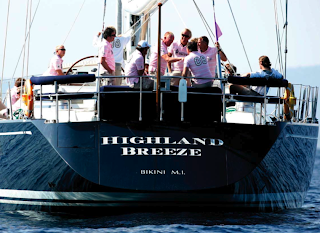 HIGHLAND BREEZE is currently available for the St. Barths Bucket, Antigua Sailing Week, and the St. Maarten Heineken Regatta. 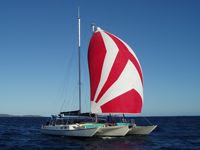 Length: (m/ft) 34.34 / 112'08"
Charter Catamaran MATAU has "New Crew"
OH WOW...WE’RE OFF TO MATAU ! We are very pleased to announce that we will be taking over MATAU on October 1, 2009. This beautiful new Privilege 74.5 is the premier catamaran in the Caribbean this winter and the only 74.5 available for charter in the world! Your guests will enjoy a new level of exclusivity in MATAU’s luxury 5-star interior. We have enjoyed the past fifteen months aboard TRUE NORTH and we are delighted to continue working with the owners of the luxury catamarans TRUE NORTH and MATAU, and look forward to the years ahead. During our tenure on TRUE NORTH, we completed fourteen charters, three boat shows, seven owner weeks, twelve weeks of maintenance / haul out and nearly 10,000 nautical miles – all in spite of a sluggish world economy. We even found the time to sail MATAU across the pond from the Med! So you can be secure in the fact that we have sailed many miles on MATAU and that we know her systems well. We have always worked very hard to ensure that our charter guests enjoy a memorable and care free charter experience with us. 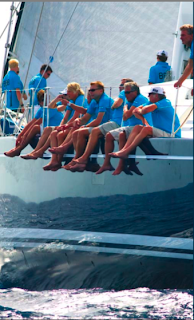 We enjoy the fact that we have become known among charter brokers for creating a truly unique experience for your clients. Some of the personal touches that we have shared with charter guests during our time on TRUE NORTH are “Idol Night” -- where everyone is a star!, hat parties -- everyone makes a hat from scratch, a good old fashioned game of charades, an elegant beach barbecue, a pirate treasure hunt – planned for the kids -- but the parents seemed to enjoy it more!, “TRUE NORTH Oscar Night”, sports playoffs, and even a special appearance from Elvis himself! We have never had a guest turndown an invitation to one of these fun adventures. At this time we are pleased to introduce to you the two new crew who are joining us on board MATAU -- chef Patrick Labrosse and stewardess Yuliya Miroshnyk -- an impressive team! Both have extensive motor yacht experience and together we look forward to combining the elegance and luxury of MATAU with an International crew and first class service. We will of course continue offering the unique style of charter that we are known for and that our guests love, but taken to a new level on board MATAU. MATAU & TRUE NORTH continue to share the same dedication to guest service and luxurious sailing charters throughout the Caribbean, representing two different price points to offer to your clients. You may be confident that your clients will always enjoy Matau's and True North's tradition of good care and excellent service. Thanks! 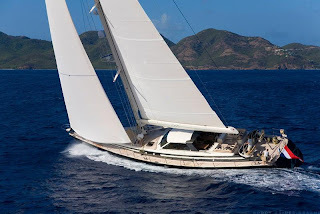 We look forward to visiting both Matau and True North at the Antigua Charter Yacht show in December. By the way... Matau is already booked for the holidays, but as of this posting, True North is available for a New Year's charter in the British Virgin Islands beginning on December 28th or thereafter! The motor yacht VICTORIAN ROSE has a couple of end of season specials to offer! Victorian Rose, based in Wickford Cove (Newport, Rhode Island), is available for 4-person charters in New England this summer and fall. This winter, Victorian Rose will be chartering in Florida and the Bahamas. 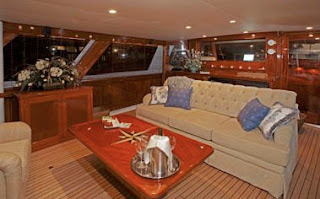 Victorian Rose, a 63-foot Burger motor yacht, is perfect for 2 couples or a small family. Guest accommodations are located aft and the crew are forward with their own head and shower. The master cabin is full width with a Queen berth and ensuite head and shower. The Guest cabin has twins with a separate head and shower. Victorian Rose has an air conditioned and heated aft deck with removeable Isenglass curtains... State of the art entertainment, too! Plus there is the experienced charter crew of Bob Davidson, Sharon Munroe, and Peter Limmer. 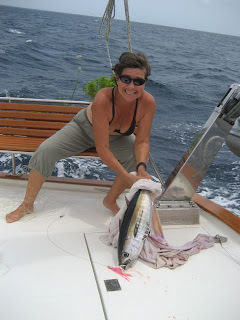 Dominique and Michel, owner-operators of the 52-foot Irwin charter yacht Blithe Spirit, sent us a couple of photos recently with a tuna they caught on their way down island. Cook the potato with the peel on until tender (I use the microwave) let cool. Peel and mash. 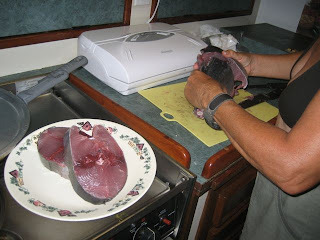 Chop the tuna finely and gently mix with potato. Add all other ingredients, except oil. Form into small little balls and flatten a bit. Cook a few at the time in hot oil and drain on paper towel. You could replace the tartar sauce with a teriyaki sauce or a chutney. You can replace the corn with chopped red pepper. BLITHE SPIRIT is available for charter in the Grenadines through December (they are booked for Christmas and New Years in the Grenadines). They have a BVI charter beginning February 1st, so a January charter could be anywhere in the Eastern Caribbean, depending on dates. Dominique & Michel will then be chartering in the Virgin Islands throughout the spring before heading south for the Grenadines in early summer. Take advantage of cheap airfares & come sailing!